If you have any questions regarding the material covered in the How to create a membership site series please ask them here, using comments. The membership series consists of a number of pages. Don’t forget to specify which part of the course you have questions about. For things not covered in the tutorial or for these that require investigating your private website, please use our support forum. I’m building a new membership site for a trade association. There is a current site where members have a profile which can be searched for by visitors. I’d like to recreate these profiles as a custom post type (like a clasified ad) in the new site and attach them to a specific user, so the user can edit them in the future. Is there a way this can be done? that’s correct. If you want member profiles to be searched for by visitors, the only option now is to recreate these profiles using a CPT. That’s because the Search Views created in Toolset can be based on a CPT only (regulars Views can be based on Users (WordPress profiles) but not Search Views). I realise I will need to do a CPT for the profile, but I can a link a cpt to a specific user? So for example I create a CPT for bsga, can that cpt be linked to only that users account (and admin) so they could edit it in the future? Or will other members be bale to edit it? There are a few ways to restrict edit access on the post level to the admins and a specific user. You use our Toolset Access plugin. Toolset->Access Control->Post Types tab, locate your CPT and then the “Edit own” column. You can restrict access privileges on a form level as well. You will find it in Toolset->Access Control->CRED Forms tab. Next, you need to locate the “Edit Own Custom Post with CRED Form” column. (in the case #2, a post that was created using this form). It means that your users need to be logged-in when creating the profiles (I mean the CPT-based profiles). So in your case the registration process would be two-step process – first you need to use a CRED form to create the user, then, you redirect it to the page that inlcudes a login form and allows to add additional data (it will create the CPT-based profile). Are you a Toolset user already? I’m not sure how much details you need. I am a Toolset user – but still a beginner. This is the first project I’ve used toolset on. I’m using it with Divi. 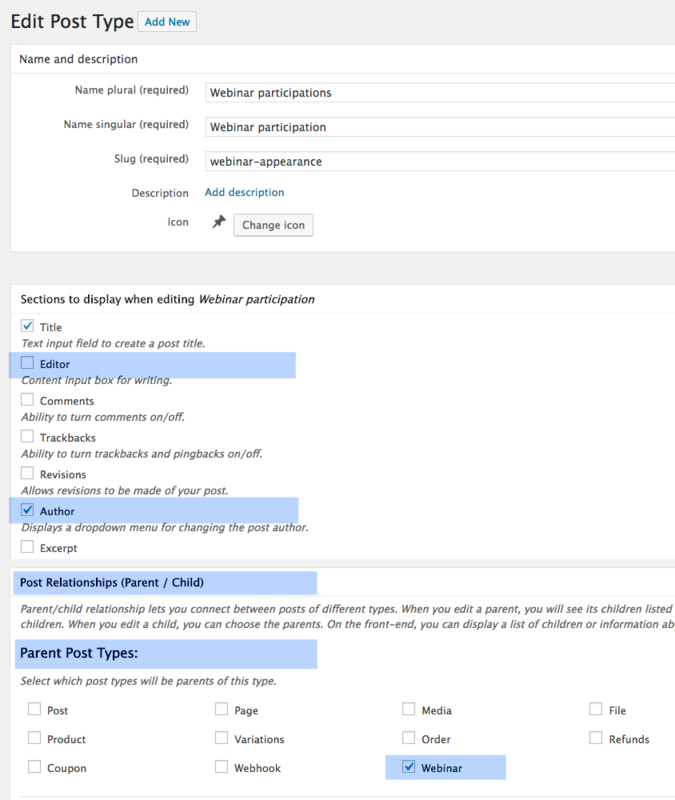 Is there a way to assign authors to posts that I create, so those CPT’s belong to that author? If I ca do that, then I can assign a CPT profile to the user allowing them to manage it going forward. Thanks, it helps. First, you need to go to your CPT definition (in Toolset Types) and locate the Section to display when editing option. Expand it. Then, check the Author field. This way, you will see the post author for each post of that CPT in your admin. Now, you can change it manually, if needed. If you want this field to be set to the user profile (WP profile) creating that post, the post needs to be added by this user, when the user is logged-in. So you will need to create a front-end form (CRED) that adds new posts of your profile CPT. I think I’ve got a work around. When I import the users from the old site, I have to assign them all a role of admin. I then assign the as the authors of their new cpt profile, and then change the roles to members so they can only edit their own profile – for which I’ll create a front end form using cred. Here I reply only to topics covered in the membership tutorial series. Sorry if I didn’t make it clear enough. Please create a ticket in our support forum. I’m sure one of our supporters will help you with your issue. I have a training site that uses two custom post types to manage Training and Participants. All Participant posts are children of a Training Post. The “Training” posts are created by training coordinators that are set as Authors. The site members are Subscribers that can view the Training posts and create child posts of the Participant type. Everything on the front end is done using CRED and works fantastic. Members are able to view a list of courses that they’re signed up for by filtering where the author the same as the current logged in user. Training Coordinators are able to see everyone that’s signed up for each of their courses. Occasionally though, Training Coordinators will need to add people to a course. This means that the Training Coordinator will be the author of the Participant post and members will not see themselves as signed up for a course. If CRED could allow for the reassignment of post authorship, that would solve a lot of my problems. Hi Darryl, thanks for taking extra effort and explaining all the details. You are right, we are missing that feature in CRED. I have listed it here . We are going to send a newsletter to Toolset customers to ask them to vote for features they find lacking in Toolset CRED forms. It will help us to identify the most wanted features. If you could leave your note there (in comments), it would help. As a workaround, you can let your Training Coordinators change the post author in the WordPress back-end. To make that happen, you need to check the Author option first for that CPT (in Types option, please see this screenshot) so they will see the post author under the post body. I have to build a membership site and my client was requesting to use Buddypress. Do you have a list of BP features that could not be available with Toolset solution in oder for me to argue with him ? Hi Pat, it depends on what your customer expects. Buddypress is a dedicating plugin for handling social networks and it would be difficult to “mimic” the functionally it offers using Toolset. For example: private conversations, making connections, creating and interacting in groups – all these features would work out of the box in Buddypress. Hi Agnes and thanks for your return. If I’m right, Toolset has started some months ago, some work in order to integrate BP within Layout. Could you check if this is something that will be available in the future or this is totally abandonned? Hi Pat, our Layouts developers say that we have an extra module loaded if BP is active that makes a BP cell available for a minimal integration: to display BP loops such as activities, groups, users. There is no development work scheduled to empower this integration for now. I will check that when I will need to create this new site. What I’m searching in fact, is to have the functions of BP which the facility to built layouts given by Toolset. I have a Woocommerce webshop with memberships provided by the Paid Memberships Pro plugin. (https://wordpress.org/plugins/paid-memberships-pro/) I use an add-on for Woocommerce (https://nl.wordpress.org/plugins/pmpro-woocommerce/) that allows me to set discounts and special prices per membership level. Could the same functionality be accomplished with Toolset? You can create a few WooCommerce products and to use each of them to create users with different roles. This is possible with Toolset and WooCommerce. For example: Silver membership: $10, Gold membership – price: $20, VIP membership – price: $50. Then using the Access plugin you set what is allowed for each role (Silver, Gold and VIP would be your custom roles). But using our CRED plugin you cannot create time limited subscription (which expires after a certain period of time). Did I answer your question? I would like to accomplish this on a per product basis. When a member, for example a Gold Member, buys a product, he will automatically be charched the Gold Member price. Is this doable with Toolset? Now, I get it. Sorry, no, this is not possible. The only thing you could do, would be to create separate products (with different prices) and display these products conditionally based on the user role. But I realize this is not flexible enough. Hi Erik, see the Woocommerce Role Pricing plugin, https://nl.wordpress.org/plugins/woocommerce-role-pricing/ Different discount according to user’s role. Hi Agnes, I’m evaluating Toolset to see if I can use it to build a client’s website. I need to create a Membership site, where the users need to provide an invitation code when creating their accounts, and the invitation code needs to be checked, manually, by somebody in the admin side. Your tutorial should work great except that the account is created right away. Any tips on how to make them pending until approved? Thanks! here is no way to automatically upgrade the subscriptions (e.g. from subscriber to a premium user). You cannot approve user signups directly from the front-end (e.g. to change the Subscriber role to a higher one). You need to do this from the WordPress admin. You can create the accounts with the Subscriber role (or any other custom role) that has very limited privileges. While a new user is created you send an email to the admin (CRED supports it) so the admin can either upgrade that role (on the back-end, in the user profile) or delete that user. That was my solution too. It is a great to build a membersite with Toolset. I finished one, with Layouts. The only thing wat I was missing is a content dripping system. My husband made a function that works realy great! wow, nice, I’m emailing you for more details. I am looking for the css that was used in the pagination section of the testimonials. I forgot which site it was. Can you point me to that code? I just shared the link. Let me know if you meant this one. Yes Agnes, thank you very much! Instead of WooCommerce Subscription, can I use YITH WooCommerce Subscription, free version? We’ve never tried this one so I don’t know how it will work with Toolset. If it uses WooCommerce Products and WP roles is should work but this is only my guess. I am a new toolset user and a bit confused with template, layout, etc. The tutorial operates on the non-Layouts version (uses Toolset Views) while you are using it with the Toolset Layouts plugin. We have plans to rewrite all our tutorials to show how to use them with Layouts but I haven’t reached that one yet (I’m testing each step of the tutorials while writing them, it takes time). Please register a ticket on our support forum. Our supporters can access your website and check what’s wrong. I’ll register a ticket on the support forum, but probably will considerer using other solutions if I didn’t found a solution quickly. Yes, please, thank you. And thank you for your further feedback. Let me revise the message here to make it clear that here in comments I’m replying only to questions related to the material covered in the tutorials. but i it also works to just put these pages in access groups and don’t allow reading for specific groups without using the plugin. Am I right or did I miss something here? I tried it and it works so far, but would there be a downside to that approach? So we handled the logged in/out “feature” in the Visual Editor cell and we used conditional shortcodes and to display a difference navigation for logged-in users we used the plugin I mentioned. Thank you very much for the images and the explanation. sounds promising. i took the approach with the access groups yesterday and so far it seems to work. the buttons are in the footer. what i did was setting the login and sign up pages to access only by guests and the my account page to access only by all the others. and they disappear from the menu when the rights are not correct. is this another possibility or am i missing something here. so far it seems to work perfectly. Hi Gerhard, you mean Posts Groups? If so, you are right. That would work too. This is a relatively new feature (introduced with Toolset Access 2.3, released 2 months ago) and when I was publishing the membership tutorials it didn’t exist. So now I need to update the tutorial to cover this possibility as well. Thanks a lot for pointing that out. but what i am struggling with right now is the submit button on the login form. is there anyway to style it like the one on the sign up page. the sign up page has the submit button seperate and i just put the class from my theme. but there is only the shortcode for login and it doesnt take the class. i already spent a long time trying to find out where set the class or what to do, but i dont find a solution and no treats. When will be available the sample as a reference site? Hi Alejandro, soon, we are finalizing it. What do you like to see in particular? Please tell me more and I’ll try to find a way to help you. I am waiting for your publication. Is it also possible to let users post and modify messages like an author role, but only on the front-end (CRED forms)? Whitout getting in the WP dashboard? I would like to be able to restrict access to file downloads based on membership of specific groups, as defined by a custom user field. This differs from the hierarchical member groups in your example. My users may be a member of one or more specific groups, from a list of over a dozen, so the hierarchy approach just doesn’t apply. Hey Alan, yes, we don’t have any solution for such a case. Could you explain to me why you’ve decided to use a custom user fields to create specific groups of membership? The list of users is around 200 people from various statutory agencies and the voluntary sector. They are all members of one of more private groups, over a range of topics. Confidential information (eg board meeting minutes) are shared for each group, so using a “levels” approach won’t work. Each person is either a member of a group, or not. So I use a custom user field (checkboxes) to tag each user against the groups they belong to, then on their “my account” page, use conditional if statements to show each user the list of groups they belong to. Content templates for each group also contain the conditional filtering. I’ve implemented a solution for the downloads which is secure (people cannot share working links to documents with other users who aren’t in the group), but it’s not entirely perfect, hence my original question. Thanks! You can check some advanced features of the WordPress Download Manager plugin to see if you could restrict access on specific groups. Eventually we’ve decided not to include this plugin in our reference site mainly because it there were some issues in the WordPress Multisite mode which we use in our discover-wp.com site but the plugin itself is a good one the downloads which is secure. I have a custom post type called “Sectors”. These Sectors are displayed in a loop on my Home page. I’d like them to remain visible, but when clicked on, redirected to a registration page, if the user isn’t logged in. Is this possible? Awesome, thanks! Is there a way to do this via php? I’ve built everything myself so far and would like to continue doing so. For sure it is, but this is out of the scope of this support page and I’m not a PHP expert. If you are a Toolset customer you can give it a try and ask your question in our support forum. Some of our supporters know PHP and they might give you a hint. The purpose of using Toolset is to provide non-PHP solutions. I am a customer. I’ve been using Toolset for about 4 years now but always with php. I’ll give it a go. I’m currently making a membership website using Elementor PRO and Astra Theme. I have several question about Toolset before buy it. – Create 2 or more custom post types? – Create 2 or more custom user roles? – Create 2 or more regisration forms with custom fields and assign those forms to specific user roles? – Create custom fields for users profiles? – Create front-end user profile? – Let users to input and edit personal data within their profile? – Let users publish on front-end? – Create 2 or more publishing forms with custom fields and assign those forms to specific custom post type? – Create 2 or more custom filters/searches for users profiles or post types? Will I be able to do all listed above without knowing PHP? Agnes is currently on vacation and will be back next week. In the meantime, I can easily answer your question. You see, the answer to your question is – yes! You will be able to do all the things you listed, without knowing PHP. The best thing about your setup is that Astra works great with Toolset, and very soon (hopefully next week), Elementor will release a new version which provides very nice integration with Toolset. We (and Elementor team) will announce this as soon as the update goes live. Just wanted to let you know that several of the links in this article seem to be broken, specifically the ones in Section 5. I’m glad I decided to leave this comment, because your last answer also told me something I was very interested in – when increased support for Elementor will be arriving! Can’t wait! Thanks a lot, Helenmary, you are right! We will fix these links as soon as possible! I’m trying to create a online courses site. Members can buy 1 course. OK i know how to do. Give the student role acces to the course. give the student access to the student2 role. well i’m sur there is an issue. but l’m lost. I’m sorry but you won’t be able to handle such a case using roles. The “membership” works using a custom user field with simple checkboxes to show which “groups” people are a member of. In the test system there is just one Test Group set up, but I have the system working on two live sites, one has 5 groups and one has about 12, with over 100 members across those groups. The membership of each group was provided to me by the client on an excel sheet so I was able to initially populate the groups that way. However, I have also built a Toolset Form user form for the site administators to add new users and allocate them to the correct groups. Additionally on the live sites, the private group pages have a custom sidebar which displays (to site Editors only) links to custom Views to list all members, and the members of each group, and these views include links to a Toolset Form form to edit each member, (e.g if someone leaves a group, or becomes a member of another group). In the live sites, the Group Templates, and Group Post Templates are cloned for each indiviudal group and the filters changed so that the user group fields are matched to the correct group. E.g. 0=Test Group, 1=Group 1, 2=Group 2 etc. From the user perspective, after they log in they go to the My Account page, which shows them links to the groups they are a member of. One of the drawbacks is that when the site’s owner has a need to create one more group he (or you) needs to manually create a copy of the View and the CT and make some small adjustments. I didn’t test this solution.